Taking on the qualities of Cognac. As everyone who has ever enjoyed Spring Break in Mexico quickly learns, Cerveza is Spanish for beer. Cervecera Mexicana, therefore, obviously got its start brewing beer in Tecate, Mexico, in 1923 — including the famous “Cerveza Mexicali” beer. Today, Cervecera Mexicana brews and distills a wide variety specialty beers — controlling 63% of the Mexican beer market — and interesting craft spirits as a subsidiary of Grupo Modelo/Anheuser-Busch InBev. El Prohibido means the prohibited and harkens back to the distillery’s days of creating adult beverages just across the border during the Prohibition Era. 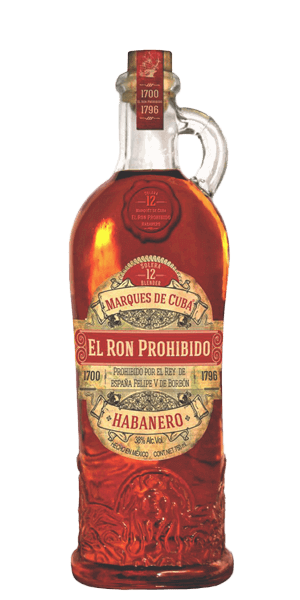 El Prohibido Rum Solera 12 YO starts as a classic cane Rum. But it is the pristine and exemplary aging process that sets this spirit apart. They age this Rum by the Solera method for a full 12 years in casks that previously held raisin wine. And it works magic, transforming the Rum into a liqueur-like spirit that tastes more like a strong, sweet Cognac with a dark, garnet hue showing through a beautiful bottle presentation. What does El Prohibido Rum Solera 12 YO taste like? The Flavor Spiral™ shows the most common flavors that you'll taste in El Prohibido Rum Solera 12 YO and gives you a chance to have a taste of it before actually tasting it. The Solera aging method was first used with fortified Wines and some balsamic vinegars. Periodically, each barrel or vat is only half emptied, then it is refilled. This way each new batch is half of the spirit that preceded it, and so on … theoretically forever. Which is why the Italians call the process “Perpetua.” Solera spirits can contain portions of VERY old spirit.